Marquette’s official Twitter account announced Monday afternoon that sophomore Juan Anderson had been granted his release. After two seasons with the Golden Eagles, the 6-foot-7 forward is transferring to be closer to his family in Oakland, Calif., and presumably to a school where he can find more playing time than the 9.5 minutes per game he averaged with the Golden Eagles. It’s a surprising–not shocking–transfer, considering Anderson came into his own in his first full season at Marquette. More than anything, injuries and a mistake that led to a suspension cost him considerable time that could have been used to progress and mature on the court. A suspension to begin the year for accepting Brewers playoff tickets rendered him ineligible the first three games of his freshman season, and that came on the heels of a foot injury that cost him most of his first preseason. A shoulder fracture later in the year cost him more time, though he came back much quicker than the 3 to 4-week timetable he was initially given. He closed his freshman season on a high note, logging spot minutes in 14 of the last 16 games, but that was quickly halted in the spring by another shoulder injury (the same one) that again required surgery. Again, he beat the six-month timetable by almost two months, telling Paint Touches in September he was two weeks away from being cleared to resume practicing. Still, that meant four months without practicing, without working out and without participating in individual workouts. A lesser player would have done what was asked of him and nothing more. But not Anderson. The sophomore again, as he had done his entire freshman season, got back up to speed quickly and was a full participant in Midnight Madness, five months after he had been given a six-month timetable for his shoulder surgery. 2012-’13 was good to Anderson. He started in 31 games in more of a replacement role for Jamil Wilson, who struggled with foul trouble early in the year, sending him to the bench. 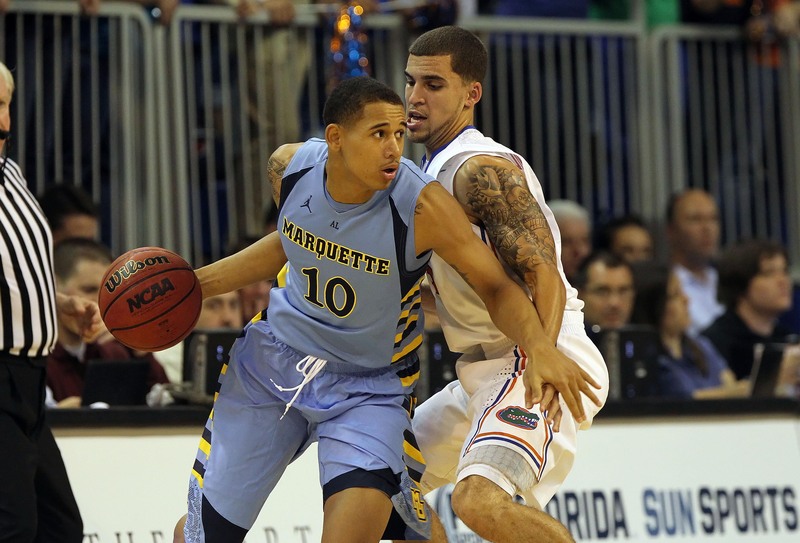 But still, Anderson was instrumental in a few of Marquette’s key wins. His nine-point, nine-rebound effort in the opener against Colgate; his memorable block on Wisconsin’s Sam Dekker to put the dagger in the Badgers; his swift 3-point shooting early at Pittsburgh. But in the end, the combination of Anderson wanting to be closer to his family and have more of an opportunity to contribute trumped his accolades at Marquette. I had the chance to meet his mother at an All-Star game in Illinois two years ago, and it’s clear the two have a special bond. When Anderson committed to Marquette in in Oct. of 2010, he chose the Golden Eagles over Arizona State, Cal and Oregon–all schools out west. Chance are he’ll find himself in a similar location, perhaps in the Pac-12, where he will sit out a year and contribute as a fourth-year junior. What it means for the Golden Eagles, however, is more important going forward. First, it gives Marquette another scholarship either to use on an uncommitted 2013 recruit or a graduate transfer (or regular transfer), or to bank for a seemingly-loaded 2014 class. It’s a good problem to have and it’s essentially a prime example as to why coaches never stop recruiting a class. No doubt about it, Buzz Williams and the staff have options they are considering. We’ll know more soon, but Tarik Black is the obvious name to keep an eye on. As for how this changes Marquette immediately, this should free up plenty of room for Steve Taylor and Jameel McKay. True, Anderson only played 13 minutes per game last year, but add that to Trent Lockett’s 27 minutes and you’re looking at a very deep, very talented frontcourt that has one less man fighting for minutes. Considering McKay was likely going to start, call Taylor the biggest winner of this transfer. If he dedicates himself this summer defensively, 15 minutes per game wouldn’t be out of the question, if not more. Was this about family ties or playing time? Was Larry Williams behind Anderson’s leaving?